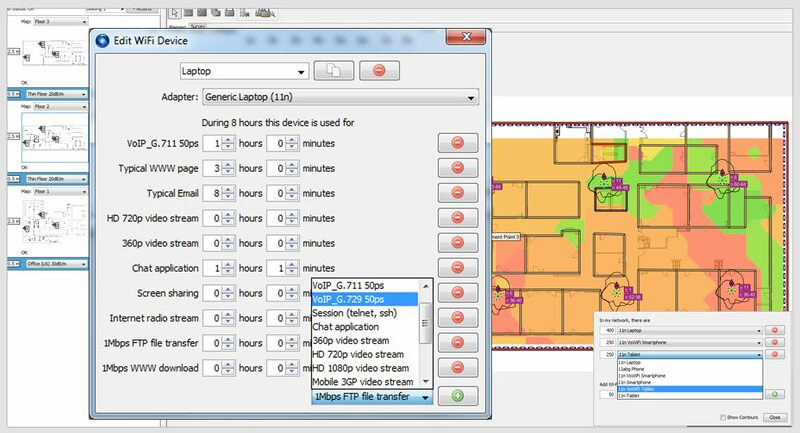 Design, verify and troubleshoot Wi-Fi effectively with Ekahau Site Survey. It’s the first and leading laptop-based Wi-Fi site survey and planning tool. ESS™ is the easiest to use, enterprise-grade Wi-Fi design and maintenance tool for Wi-Fi professionals. 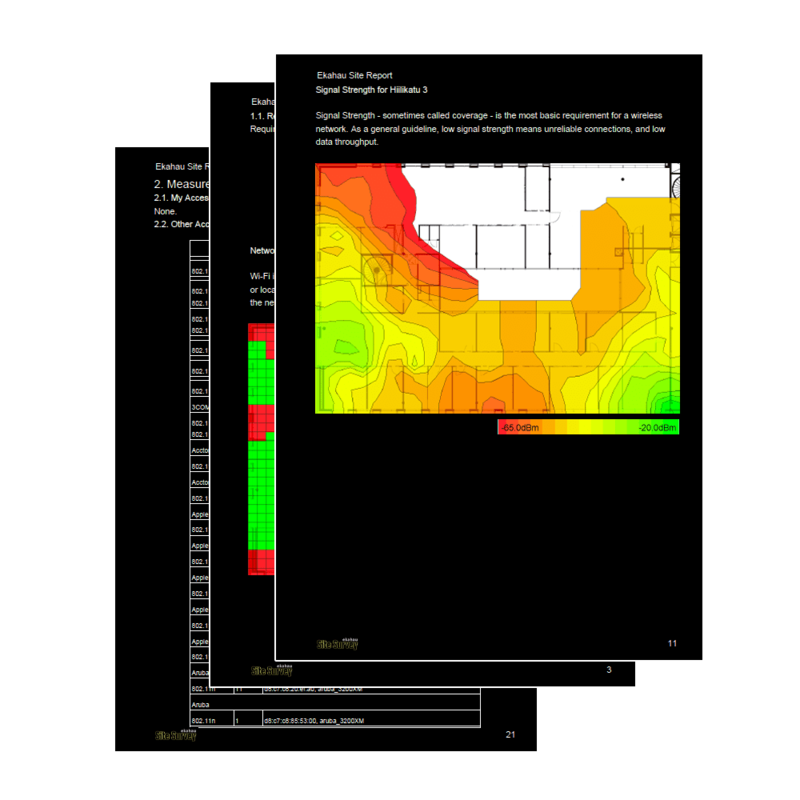 With crystal clear heat maps and easy-to-use reports, ESS makes it simple to optimize Wi-Fi. ESS will let you plan and create Wi-Fi networks according to your performance and capacity requirements - taking into consideration the increasing amount of wireless clients (BYOD) and simulating real-life application usage such as VoIP, HD video streaming and web browsing. For wireless professionals, IT managers, and administrators, Ekahau Site Survey™ (ESS) is an easy-to-use design, verification and troubleshooting tool. ESS is a visual, software-based tool that runs on laptop computers running Windows (also runs on a Mac using Bootcamp). Ekahau Site Survey ensures high performance and capacity (BYOD) for any Wi-Fi network (802.11ac/n/legacy) that is used for VoIP, video, location tracking, or highspeed data. If you don’t have a Wi-Fi network yet, ESS will automatically suggest access point placement and optimal configurations. If you already have a Wi-Fi network in place, ESS allows quick and easy site surveys, performance and capacity analysis, optimization, and troubleshooting. 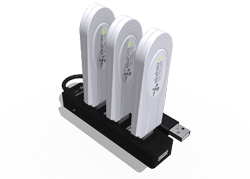 Ekahau Site Survey supports surveying using multiple Wi-Fi adapters at the same time. And it's the only tool to allow simultaneous surveying with Wi-Fi adapters and RTLS tags! Plan for capacity, coverage, and performance. ESS shows you where to place and how to configure your access points. ESS also accurately predicts network coverage, performance and capacity. 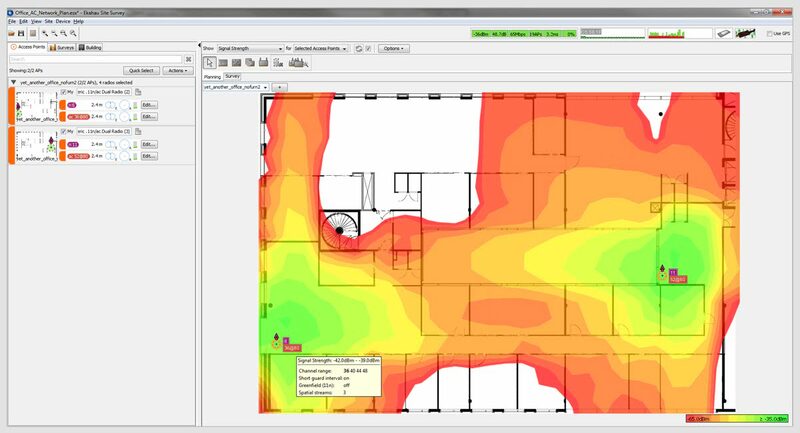 Network planning is available only in Ekahau Site Survey Professional version. Get a clear view of what is going on in your network. Ekahau's unique Hybrid Site Survey technology allows performing active and passive network testing simultaneously- in just one quick walk-through around the facility. Ekahau Site Survey also gets you going with multi-adapter surveys without any pre-configuration - just start surveying. The Network Health view compares the Wi-Fi performance with your requirements. The Capacity Health shows if all your devices will work. Detect VoIP issues, AP overload, etc. 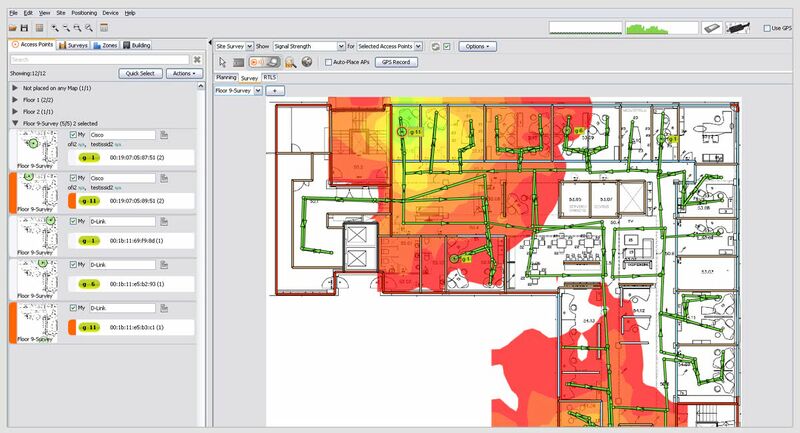 ESS allows visual map-based analysis, as well as powerful on-the-spot troubleshooting. The Network Issues view summarizes the Wi-Fi network condition; it shows why your network fails and where. The real-time views, such as Live Network Status and Live Signals, show the network conditions right here, right now. ESS creates a summarized report of the bill of materials, coverage and performance maps, and complete network layout with configurations. Automated Reporting is available only in Ekahau Site Survey Professional version. The Ekahau Wi-Fi based Real-Time Location System (RTLS) is used for tracking people and assets indoors. Hundreds of hospitals, schools, mines, and other facilities already benefit from RTLS. The state-of-the-art RTLS tools in Ekahau Site Survey enable designing and deploying Wi-Fi that will work ideally, not just for data and voice, but also for RTLS. Wi-Fi works over public frequencies, which makes it vulnerable to interference from other devices sharing the same spectrum. These include other Wi-Fi devices, as well as non-Wi-Fi devices such as microwave ovens, cordless phones and wireless video cameras. The network design challenges are shifting from coverage to capacity due to the increasing number of corporate Wi-Fi devices as well as the BYOD trend (bring your own device). ESS Auto-Planner designs the network according to your capacity requirements. 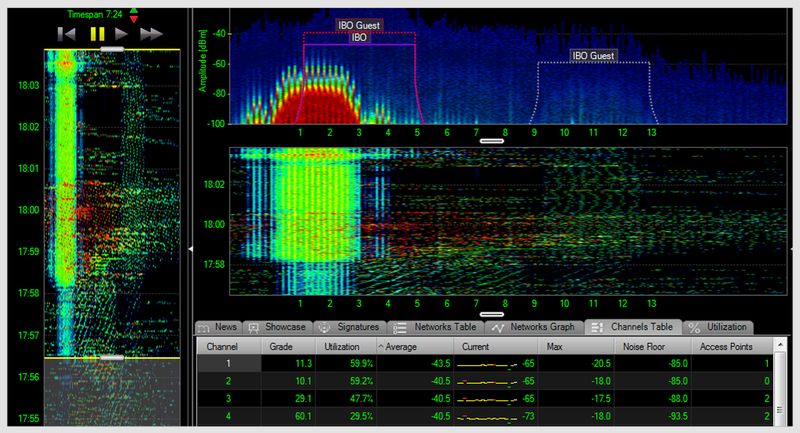 ESS also shows the overloaded APs and areas of excessive voice calls. 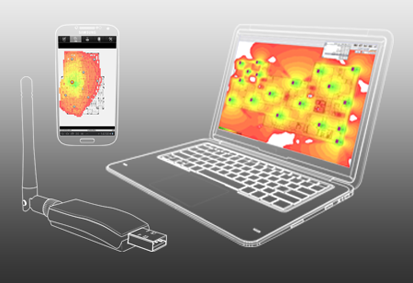 3D Wi-Fi Planning, Site Surveys, Spectrum Analysis, and Android Tool. 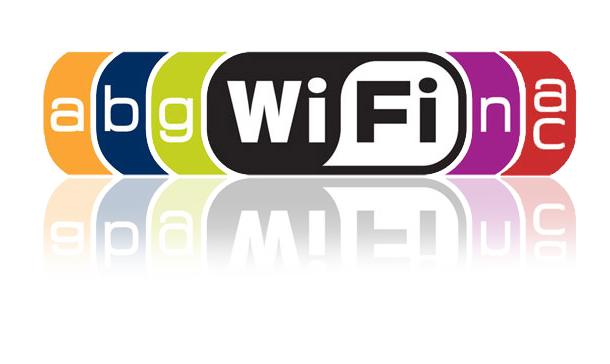 It’s the all-in-one solution for Wi-Fi design and maintenance. 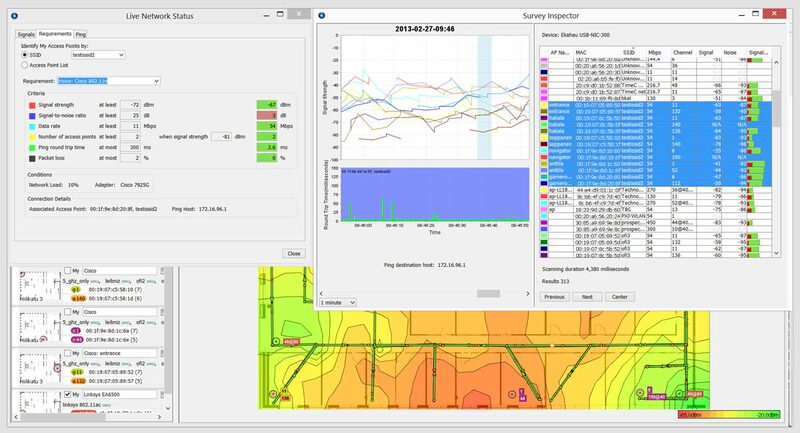 ESS Premium Pack includes Ekahau Site Survey Professional™, Ekahau Mobile Survey for Android, and Ekahau Spectrum Analyzer. Ekahau's USB-based Wi-Fi adapter, Ekahau NIC 300, is shipped with every purchase of Ekahau Site Survey. You will not need a third-party Wi-Fi adapter. 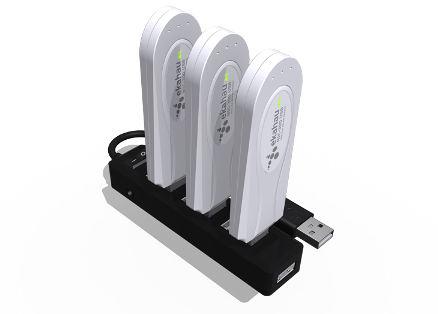 To maximize the survey speed and accuracy, Ekahau Site Survey also uses any other Wi-Fi adapter used at the same time - such as the adapter integrated to your laptop. Supported Wi-Fi Adapter: Ekahau NIC-300-USB recommended. Ekahau Site Survey is the easy-to-use toolkit for Wi-Fi (WLAN) planning, site surveys, maintenance, and reporting. It supports 802.11n, as well as the older a,b, and g standards. 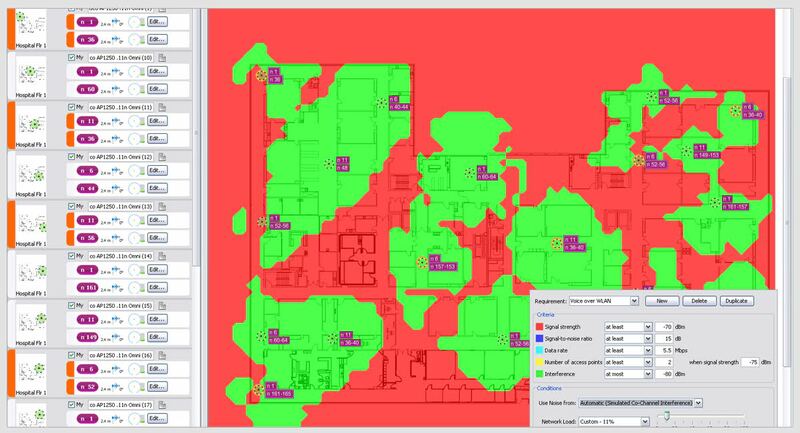 Ekahau Site Survey supports Hybrid Site Surveys in 802.11 networks: Simultaneously performed passive and Active site surveys. With a single walk-through, you'll get an extensive understanding of how your 802.11n WLAN network works - signals, performance, connectivity, everything. Our specialists are expert in designing Wireless Solutions and can help you create a plan for sourcing and deploying your Ekahau installation. 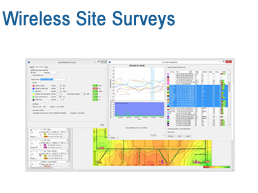 Optrics offers personalized Ekahau Solution training - a service designed to help you integrate your wireless solution smoothly into your network infrastructure.